This project is a 10 acre 250 unit senior living community located in the New Urbanism town of Celebration, now being developed by The Walt Disney® Company near Orlando, Florida. For this large and highly visible project, a team of architects was assembled by a Minneapolis senior living developer client, John B. Goodman Company. 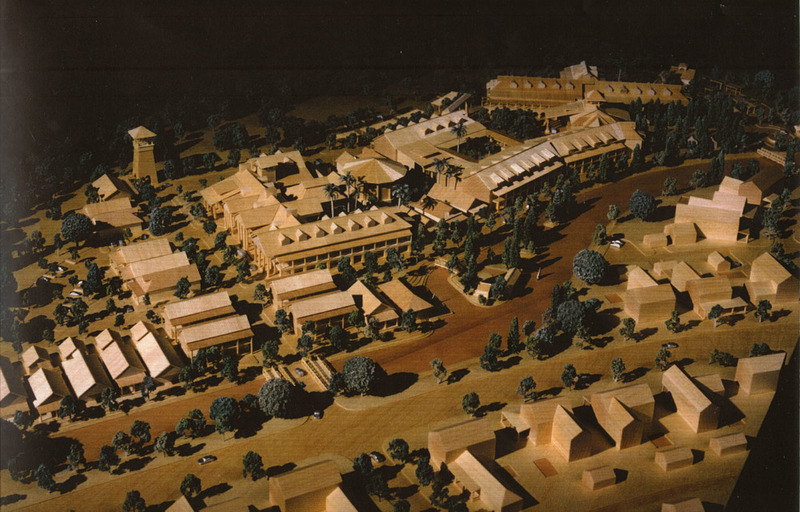 As one of eleven architects hand picked by Disney® from which developers may select for the project, ROA was chosen and acted as design consultants along with Centerbrook Architects to BWBR Architects of St. Paul, Minnesota. Together with Goodman’s own in-house architects, a total of four architectural entities worked together and made up the Design Team for this project. Through one on-site and two off-site design charrettes, and many hours of working closely together, through thorough and open communications the architectural team was able to design in total harmony.The Design Team’s goal was to integrate senior housing seamlessly into established rhythms of life at Celebration and, in the process, to invent an innovative approach to senior living. 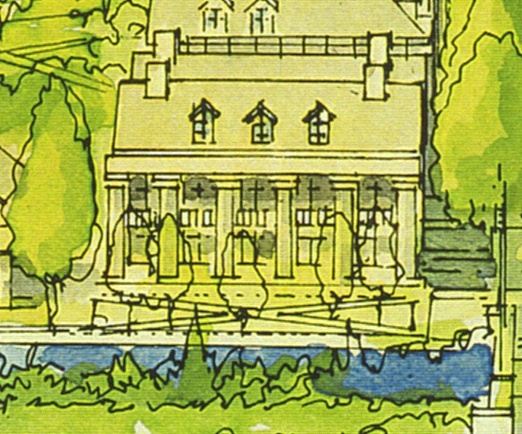 The principles of New Urbanism that form the underlying philosophy of Celebration were adopted and informed all planning. Edges of the site connect directly to those nearby. 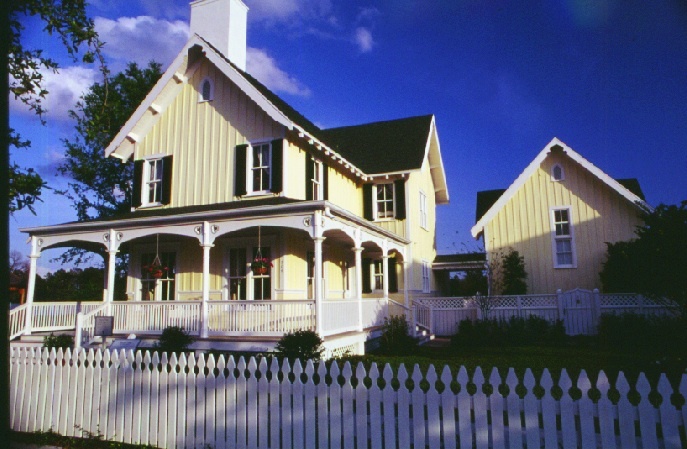 The north end is developed as a village of cottages that relates to nearby single family housing patterns and creates a small-scale foreground for the site’s larger buildings. Automobiles are limited to the edges, which are developed as active streetscapes enlivened by verandahs and porches that front, on the east, a 5,000-acre nature preserve, and on the west, an esplanade and canal archipelago. 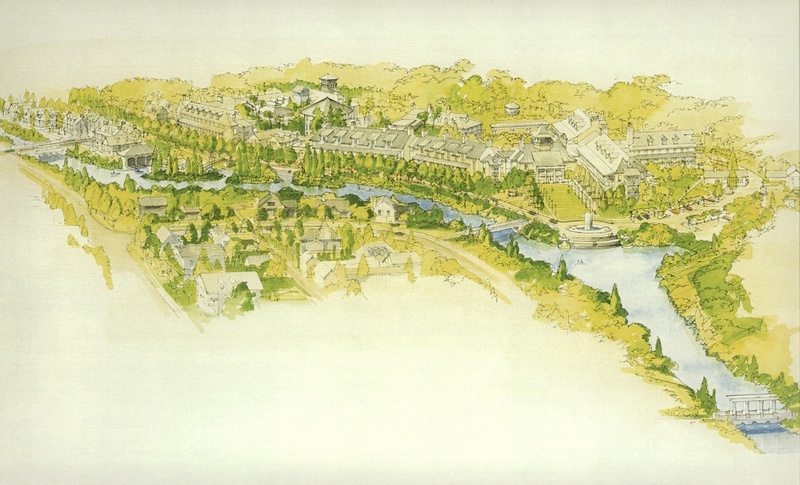 Celebration’s curvilinear streets are introduced; axes to significant Celebration features, such as the lake and its bridge folly, are locked visually into senior housing massing; and Arbor Circle is balanced by a staffed nature center with an observation tower leading to a wetlands nature walk. All available threads of Celebration have been identified, taken up, and knitted into those of the senior housing to make a continuous and elegant whole cloth. 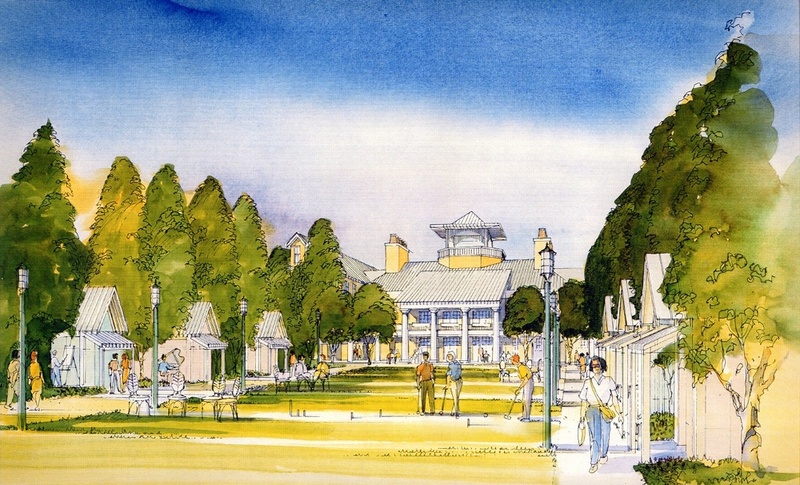 Celebration’s philosophy of community has been studied and underscores the project’s thinking. An extraordinary density of opportunities has been created for tenants to interact with each other. At the scheme’s center, residents are offered lush paseos, courtyards, and verandahs linked by venues for chance encounter, such as themed restaurants, cafes, grills, peacock alleys, porches, and gardens. Beyond that, residents are lured into creative lives outside of themselves. 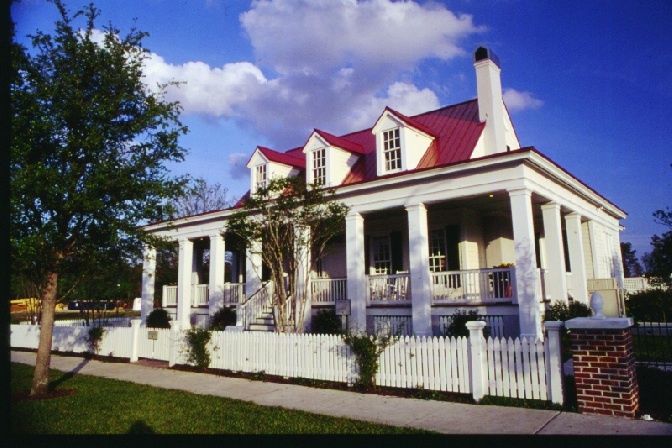 Provided are tiny sheds for painting and music, gazebos for bands, auto barns for car restorers, colonnades of studios and crafts boutiques, gardens, potting sheds, and marketplace pavilions. 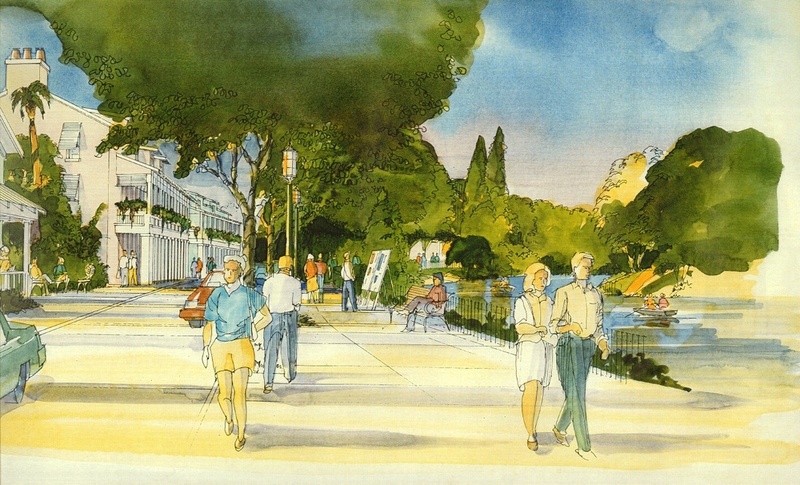 The fruits of these enjoyments will be offered not only to residents of the senior housing but also to the citizens of Celebration in crafts fairs, band concerts, garden markets, and auto shows, so that bonds of neighborliness will cross boundaries of neighborhood and age, and the promise of old— fashioned community established by Celebration’s guiding philosophy of New Urbanism will be realized in the most profound and far—reaching way possible.